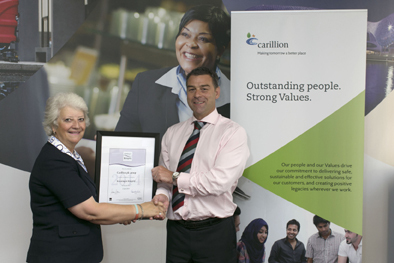 Investing in Integrity (IiI) is proud to announce that Carillion plc has achieved the Investing in Integrity chartermark as a result of successful completion of the rigorous IiI accreditation process. Investing in Integrity (IiI) is a Charter Mark, founded in 2012, and designed to enable an organisation to reassure its key stakeholders that its business can demonstrate a commitment to act with integrity at all times. IiI is available to organisations of all types and sizes. Carillion plc underwent an independent assessment, carried out by Investing in Integrity partner, GoodCorporation, having first completed a comprehensive on-line self-assessment of their ethical policies, procedures and practices. This two stage process is a requirement of full accreditation and involved site visits, staff interviews, employee surveys and a review of documentation.